I ended my preceding blog entry, about the egg industry, with the bit of contemporary wisdom, "...there's some truth to the idea that happy animals are tasty animals." I'd written the tidbit, as if I'd known what I'd been talking about. As it turns out, I may have been out in left field, at least when it comes to eggs. The basic argument maintains that when food animals are kept in clean comfortable environments, with ample room to scratch, pack, waddle, roam, graze, mozy, or whatever else animals happily do, the animals will be healthier, thus food products (meat, milk, foie gras, eggs, etc..) gleaned from said animals will be of better quality and tastier than foods gleaned from abused animals. It makes so much sense, I'd filed it in my brain under common sense and never questioned the validity of the idea. However less than 24 hours after writing my piece, I was listening to The Splendid Table's weekly Podcast with special guest, Tamar Haspel. Tamar Haspel is a food blogger and an advocate for humanely produced home grown food. Her blog, Starving Off The Land, chronicles her ongoing attempt to eat one thing every day which she's hunted for, fished for, grown, or gathered. In an experiment, described in an entry on her blog, she fed a group of blindfolded subjects three kinds of boiled chicken eggs, supermarket eggs from factory farms, supermarket certified organically grown eggs, and fancier Country Hen certified organically grown eggs. She'd wanted to prove to naysayers that certified organically grown eggs taste better than eggs from factory-style farms. Her results actually ended up showing there's no correlation between the source of an egg and the tasters' preference for one over another. I can think of at least two former college professors of mine who would throw hissies at the idea of any conclusion being drawn from this data. First of all, the group consisted of six people from a single geographic region, which is hardly a statistically significant sample. There's also the admission, "It was not a dignified event, and at least two shirtfronts will never be the same," which may have resulted in inadvertent biases against bites that stained particular articles of clothing. Even though the makeshift study is far from being scientifically conclusive, the results are enough to give the layman something to think about. According to an article in Time Magazine, from July of 2010, "factory eggs are going for $1.69 per dozen, cage-free for $2.99 to $3.59, and organic for $3.99 to a whopping $5.38." 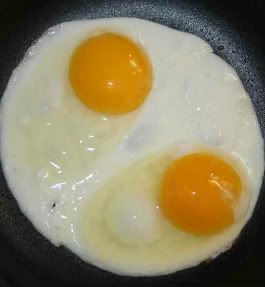 Yet, the eggs average the same 6.3g of protein, 0.36g of carbohydrate, 41IU of Vitamin D, and 70 calories. Given that the only numerical difference, between differently produced eggs, is price, one is forced to ask why they should buy expensive organically raised and/or cage free eggs? The short answer is, humanity. Chickens are typically crowded by the thousand into huge factory-like warehouses, and are given less than half a square foot of space per bird. Then, they have the end of their beaks cut off, without anesthesia, in order to keep the overly stressed birds from fighting one another. While the resulting product may be as good as its more expensive counterpart, there's something to be said for not rewarding farms which maintain concentration camp like conditions. On the other hand, the conscientious consumer can find something morally objectionable regarding many of the foods we buy. Some people won't eat veal, because calves are taken from their mothers shortly after birth and are slaughtered. Many, who can afford to, limit themselves to only eating sustainably humanely raised meats and animal products. Vegetarians avoid eating any meat, believing all slaughtering of food animals to be immorally cruel. Vegans go a step further, and remove all animal products from their diet, objecting to any enslavement of animals. Even many of fruits and vegetables we eat are harvested by low paid migrant workers, many of whom are here illegally. The question of which eggs to buy, as well as the larger question of a morality driven diet, is a tricky one. With the economy such as it is, many people simply can't afford to pay top dollar for cruelty free eggs. Feeding one's family has to come first, realistically. Sure, we could, technically, survive on animal free diets. If we choose that route though, shouldn't we pay top dollar for fair trade produce? Ah, but there's that fiscal issue again. There's also the idea that eating is about more than mere survival; for many, cooking and eating are sources of pleasure, even self expression. I, for one, don't want to live without eating the occasional omelet, fried egg, breakfast scramble, deviled egg, or quiche. In the final analysis, I think it's up to each one of us to weigh the facts and decide where to draw the line. If rewarding responsible farms, for humane treatment of egg laying hens, is important enough to you justify paying top dollar for a product equal in quality to its cheaper counterpart, I can respect and admire that. However, if you buy the cheap eggs in order to stretch every dollar and feed your family, I can respect and admire that too. One of my favorite egg recipes is one I saw on the show Ask Aida last year. This Baked Eggs recipe provides the eater with individual ramekins of savory cheesy gooey goodness. The dish is perfect as part of a weekend brunch or as a stand alone breakfast. Clicking the recipe's title will whisk you to its page on Food Network's site. This is really interesting once I got to read it. We don't have that dilemma over eggs here in the Philippines though. Maybe 95% of the population is not aware there's even such thing to think about. It goes the same with the meat. Egg is egg. Meat is meat. A lot of the people live in poverty all their life, so they can't spare the comfort of the chicken before they got butchered to their death over sense of morality anyway. James a lot of people I know are no raising their own chickens in their backyards. People I wouldn't have expected. Is that trend in Portlandia too? Salem has legalized it within residential areas, and; Portland, Beaverton, and Hillsboro; are debating whether or not to allow it. I can see how it could cut food bills for families. I'm simply not sure I want my neighborhood to smell like chicken $h!t. Great post. When our family saw Food Inc. we did try to buy and look for organically grown eggs, but it can be pretty expensive. It's good though that the Humane Society and United Egg Producers have reached an agreement regarding this. Yes, it's a positive step forward. 18 years is a bit of a long implementation period, but things will eventually improve for egg laying hens.